Historical maps offer a vivid record of previous generations’ mental landscapes. They can help us understand the nature and characteristics of other cultures’ knowledge of the world. This talk draws examples from the collection donated by Sir Hugh Cortazzi to SISJAC’s Robert and Lisa Sainsbury Library in order to answer the question: How was the outside world understood in early modern Japan? The focus is on two periods of dynamic changes in early modern worldviews: the second half of the seventeenth century, which witnessed the emergence of a playful urban print culture; and the turn of the nineteenth century, in which a renewed interest in foreign knowledge was coupled with threats of invasion. My analysis shows that the urban audience’s perception of the outside world was shaped by attempts to assemble a viable worldview through the maps’ visual persuasiveness. 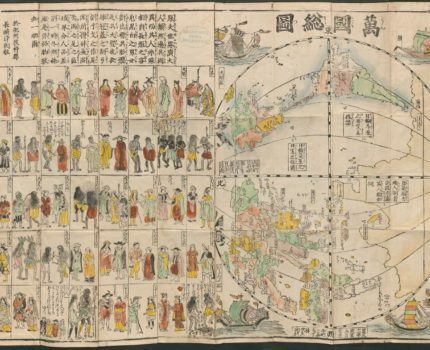 Maps thus emerged as contemporary tools for thinking about a continually changing perception of the Japanese archipelago among ‘myriad countries’.